As some of you might know, I used to do a podcast called Tom vs. The JLA (then the Flash, then Aquaman, just got to tomvsdcu.posterous.com) I stopped because portfolio school got too hectic. Now I'm looking for a copywriter gig and I got some free time, so let's get this show on the road. My creative energies need to go somewhere. 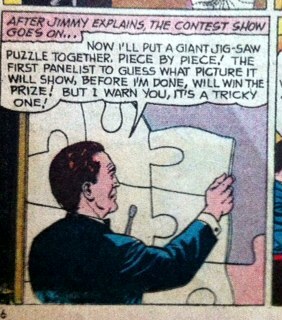 I am going to be talking about Jimmy Olsen for the next week. Embrace it. Also take a look at my portfolio. The worst game show of all time.